One question that always intrigues me is when did people first realise that someone had died and feel the need to actually bury them as opposed to just discarding or eating the corpse? Also what happened to make these same people feel the need to actually bury the body with ritualistic ceremonies and symbols, in other words when did people acknowledge death? The earliest known ritualistic burial in the UK is that of the ‘Red Lady of Paviland’ which dates back to the Palaeolithic period between 28,000 and 21,000BP. In Devon the earliest known human remains are a jaw bone and teeth found at Kents Cavern and date to around 31,000BP although these cannot be classified as a ritualistic burial. On Dartmoor we aren’t doing as well, because of the peat and its high acidity the ground is not conducive to bones and burials and the only thing we have to go by are the tombs in which the bodies were buried. Sadly, as far as early burials go there is not a lot of evidence, certainly there is no lack of Bronze Age features but any early traces are hard to find. From the available archaeological evidence it is known that hunter gatherers were on Dartmoor during the Mesolithic period as there have been numerous finds of flint tools. Surely during this time somebody must have died on the moor but as yet there has been no evidence of such an occurrence. “Large chambered tombs represent significant physical effort and social organization. They were of specific importance in the disposal of the dead. The acid soils of the moor mean that the bones deposited within these structures have not survived but it is known from other areas of the country that often only certain selected bones were permanently placed in these tombs. It is also known that they were communal vaults designed for successive burials and that they probably formed a focus for the community.”, (1997, pp.30 -31). Today, the best example of such a tomb is Spinster’s Rock although this has been re-erected follow a collapse and the true authenticity of the restoration is doubtful. Below are listed some of the more likely candidates to have been Neolithic burial tombs all of which occur around the eastern and southern edges of the open moor. Name of Location National Monuments Record (online source). These chambered tombs are in some instances referred to as long cairns and the ‘chamber’ itself is considered to be a cromlech. This term comes to us from the old Welsh/Breton words, crom, meaning ‘bent’ and llech, meaning ‘flagstone’, cromlechs are also known as dolmens, portal dolmens or quoits. English Heritage describe the monument as being: “A Neolithic burial monument comprising a stone-built chamber within a mound of earth or stone“. This basically describes the chamber which on Dartmoor is usually three upright slabs which are topped by a large flattish capstone. The chamber was sited at the widest end of the mound and their axis appear to be on a north – south direction which bucks the national trend that is commonly of an east-west alignment. But apart from the obvious what significance did the chambered tombs have for the Neolithic people? Modern thinking agrees on one thing, there were distinct regional differences in the variety, size and use of these tombs, in many cases these variances manifest themselves in quite small areas. Having established that, one is then presented with a whole plethora of ideas as to the use and meanings of the tombs which range from probable to fanciful. There will never be a right or wrong conclusion to arrive at as we simply do not know what was going through those peoples minds 6,000 odd years ago. Sadly, there has been no modern investigation of the Neolithic tombs on Dartmoor so any conclusions have to be drawn from a nationally wider context where excavations have been carried out. This means it is a case of examining all the theories and finding ones own explanation which sadly these days is not too easy. I have read many of the exemplar studies and sadly these days you need to be a student in philosophy, psychology and numerous other ‘ologys’ to understand what many of the authors are trying to say. A few years ago I attended a day seminar on the Neolithic and to be honest I left halfway through purely and simply because the speakers were using so much techno-babble that I could not grasp what they were trying to say. Now, I am going to ramble off into the wide blue yonder, there was a brilliant article written by Dr. Miles Russell (2007, p.31) where he discusses the popular practice of, “archaeo-doublespeak”. This he defines as being the modern trend whereby meanings have been obscured to such a degree that to do so can now be considered as an art form. This verbal camouflage manifests itself in such archaeological phrases as, “ground intervention” (digging a hole), “hypothetico-deductive explanation” (a good guess), or “discrepant identity” (Romanization). The highest spot point on Dartmoor is High Willhays at 621m and the lowest is Venn Farm at 73m so it could be argued that the Dartmoor examples could have been located higher if that was the intention. The monument was then built and one of two things happened, it was either completely covered by a mound of earth/stones or the structure was surrounded by a low cairn or platform which partially covered the tomb. Incidentally, it has been estimated that to build a Neolithic tomb it would have taken between 7,000 and 16,000 man-hours (or respecting certain viewpoints, person-hours) depending on its size and form. This simply could not have been achieved unless there was some form of social organisation. There can be no doubt that when these structures were newly built they must have made for an impressive sight and one that perhaps intentionally reflected the importance and ability of the society that built it. Having built the tomb what then went in it? Again drawing from national evidence, Russell (2002, p.63) points out: “… the stone-chambered or stone-structured long mounds of Western Britain have produced sometimes considerable quantities of articulated, disarticulated, disassembled and cremated bone“. These bones often came from several individuals and were usually mixed up, they were placed in the tombs after the bodies had completely or partially decomposed somewhere else. So what does this mean? Now we are getting to the more gruesome part, it is assumed that when a person died their corpse was taken to a mortuary enclosure where it would be left to have its flesh removed by the local wildlife. This method is sometimes referred to as excarnation or a ‘Sky Burial’ and it meant the copse was laid out on some platform and the birds, animals and insects would then devour the body thus resulting in the complete de-fleshing of the bones. Such places have been described as a, “reeking necropolis whose awful silence was broken only by the din of crows, (Edmonds, 1999, p.120). Castleden (2003, p.91), gives examples of where bones have been found that show evidence of having been gnawed by rodents and scavengers or having snail eggs laid on them. In some cases bones have been found with cut marks on them which suggest a degree of human intervention to assist the defleshing process. Castleden considers that it would take about a month to remove the flesh from a skeleton and a year for it to become completely disarticulated. 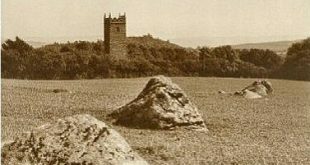 There is possibly evidence for this practice having taken place on Dartmoor and that comes in the form of an enclosure that sits near to the tomb at Corringdon Ball. Butler (1997, p.155) tells us: “…on the opposite side of the East Glaze is a low bank barely 0.3m high bounding a rectangular area (112 x 34 m) empty of any interior structure, its long axis orientated east to west characteristic of a mortuary enclosure of middle neolithic date“, ( Corringdon Ball Enclosure – ADS Record ID – NMR_NATINV-442014 ). “This understanding relates to what we know of contemporary involvement with early agriculture, and hence preoccupation with fertility and with control and division of land – a subtle but important issue in a semi-nomadic society where physical boundaries were not apparent. It was presumably these interests in land rights that developed alongside and then into veneration for ancestors and regard for descendants“. “In ritual, human bodies are at once participants and symbols alongside other symbols. Of course, when those bodies are dead, they will undergo a series of changes, and the transformation of the body (whether by the inevitable decay or by the intervention in the form of de-fleshing, disarticulation or cremation) provides a potent source of symbolism. In some cases, the rotting away of the flesh may serve as an homology for the gradual freeing of the soul, but this is evidently predicated upon a particular form of eschatology. None the less, the framework of ‘rites of passage’, which serves to signify the change of state of a person in a variety of life-crisis rituals, is sufficiently widespread to deserve consideration in any archaeological situation“. (Thomas, 2001, p.129). Which I think is what I was saying previously, the title of the above book is ironically called, “Understanding the Neolithic”, never mind the Neolithic what about the present? It could be said that these rites and rituals led to the very fabric of of a recognised social order insomuch as to right to officiate at such gatherings was given to the tribal/family heads or shamans which set them apart from the rest of their society. As the Neolithic period began to merge into the Bronze Age there was a marked shift in the design of tombs, rather than concentrating on communal burials they moved toward individual burials. The cairn shape moved from an elongated shape to a round or oval one, was this move towards individuality a reflection of the growing hierarchy of people of note? Certainly something was happening with regards to what people believed as not only did the presentation of tombs begin to change but other ritualistic monuments began to appear such a stone rows. Castleden, R. 2003 Britain 3000 BC, Sutton Publishing, Stroud. Edmunds, M. 1999 Ancestral Geographies of the Neolithic, Routledge, London. Pryor, F. 2003 Britain BC, Harper Collins, London. Russell, M. 2007 The Dangers of Archaeo-doublespeak, Current Archaeology No. 212, London. Russell, M. 2003 Monuments of the British Neolithic, Tempus Publishing, Stroud. Taylor, A. 2001 Burial Practice in Early England, Tempus Publishing, Stroud. Thomas, J. 2001 Understanding the Neolithic, Routledge, London.